Colorful sunrise clouds over the Teton Range just before the first light hits the peaks of the Teton Range in Grand Teton National Park. 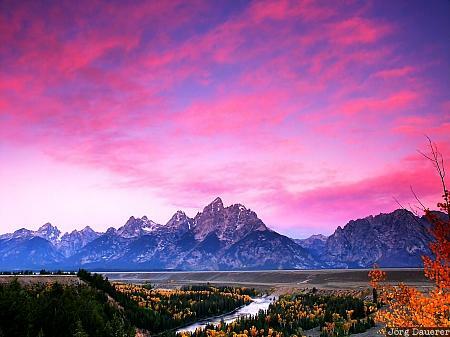 Grand Teton National Park is in the west of Wyoming, United States. This photo was taken in the early morning of a sunny day in late September of 2003 from Snake River Overlook. This photo is part of the exhibition Colorful Sunrise (October 2013). This photo was taken with a digital camera.